This book is an guidebook for elegant girls. I think it is the sweetest thing. It combines the things you want to your daughter to show alongside biblical virtues. Many of us did not learn to why of being mannerly. Sheila points out that it glorifies God when we show respect for ourselves and others. I thought Sheila did a great job of mixing in fun things like which type of tiara fits your face type with how to dress modestly. My daughter loved answering the quizzes in the book. We had oodles of fun reading it together. I even learned a few things and cemented some others for myself. 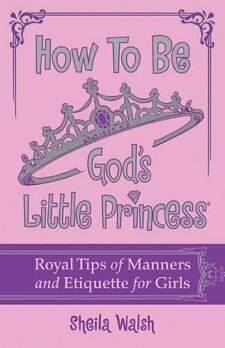 If there is a little princess in your life, I highly recommend this book of manners to teach her how to act like a daughter of the King. Five Stars. Book Description: What does it take to be a princess? Sheila Walsh has some important answers to share for every little girl. This trendy design features black & white line art and a two-color pink and black interior. The art will tie to each how-to topic in the book-how to make the best pink cookies, how to wear a tiara, how to earn money at home, how to care for a royal dog, how to be respectful, how to use good manners, how to help Mom, how to follow Jesus, how to act like a princess when things go terribly wrong, and many more. oooohhh...I'm going to have to get this one! Another one for you to put on your radar is by Dannah Gresh. It is called "Keeping the Little in your Girl" or something close to that. ha! There is a great devotional too...but it geared more toward the 8yo+ girls and their mamas.